Zucchini (1) - Trim ends and discard, quarter lengthwise, then slice across into 1/2" cubes. Kale (3-4 leaves) - Remove stems and slice at angle into 1/4" pieces, then roll leave into a large roll and slice across into 1/2" strips. Snap Peas (2/3 cup) - cut fibrous ends and discard, then peas in half at an angle. Bring small pot to boil. Add black quinoa to boiling water; stir. Cover and reduce heat to medium-low. Simmer 16 minutes, or until liquid is absorbed and quinoa is tender. Heat large saute skillet to medium-high heat. Add zucchini and kale stems to skillet. Add kale leaves to large fry pan. Add 1 1/2 tablespoons water. Cook 1 minute, or until water cooks off. Add snap peas and edamame to large fry pan. Cook 2 minutes, or until zucchini and snap peas are tender. Divide baby spinach evenly on each plate. 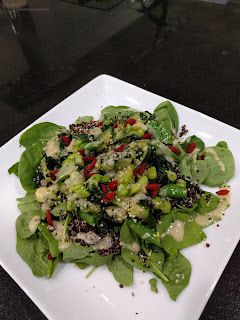 Spoon black quinoa evenly on each plate over spinach. Top each plate evenly with sauteed vegetables. Drizzle miso vinaigrette over each plate to taste. Sprinkle plate with hemp hearts and goji berries.